HERE IS Maria, stalwart of 'Maria's Market Cafe', Borough Market. 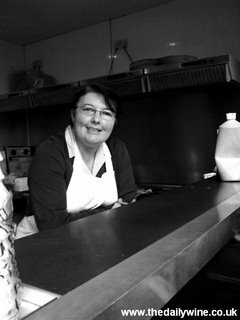 A lovely lady - surrogate food-bestowing mother, wit and neighbourhood gossip. Perfect. 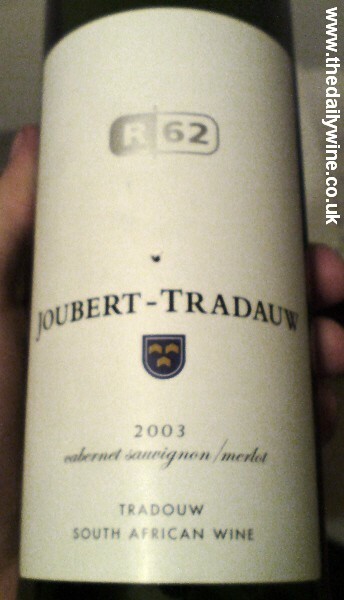 I am currently drinking Joubert's Tradauw 'R62' Cabernet Sauvignon Merlot '03 [£9.99, Oddbins], a handpicked, oak-fermented, oak-matured, unfined, unfiltered Big-Boy from South Africa. Resembling hyper-indulgent general berry pavlova with an absorbotent whack of alcohol (14p/c declared, 15.7% suspected), this is a un-ignorable wine, the antithesis of coy. In contrast, but still from the Oddbins line-up, my local manager implored me to try the Oddbins 'Own White', a trashy, vulgar, insipid, urine-soaked dirty apology best avoided.